Before you take on an opponent like the ghost, prep with this drill. I�ve discussed several drills that you should use at the beginning of your practice sessions to get your stroke straight and your cue ball speed in working order. Now it is time to work on your pattern play. Instead of simply racking the balls, breaking and trying to run out, I use a drill that ensures that I will be practicing shots that are going to come up in every rack. This drill forces you to do everything with the cue ball. It requires that you have good speed control. It always requires that you stay on the right side of the ball. Arrange the balls as shown in the diagram. It is essentially a diamond at each end of the table, with the 9 ball added. The next numbered ball is always at the opposite end of the table. 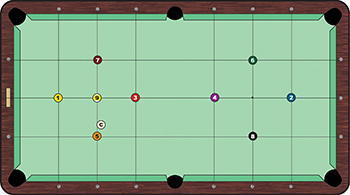 You must run the rack without allowing the cue ball to hit another object ball. Ideally, you will pocket all of the balls in corner pockets. Decent amateurs should be able to complete it after three or four attempts. To add a degree of difficulty to the drill, limit yourself to the pockets on only one side of the table. That is more of a pro version. Start with cue ball in hand. I usually place the cue ball as shown in the diagram and come off the bottom rail and side rail for position on the 2. You should use a minimum of one rail on each shot, and you are trying to keep the cue ball in the middle portion of the table for each subsequent shot. This is a great drill for amateurs because it isn�t a terribly difficult drill, but it isn�t easy. If you don�t play good patterns, it will catch up with you before you complete the run-out. It is a great way to get a feel for the table. Also, even if you don�t complete the drill, it is very easy to set up, so you can keep repeating it until you successfully complete it. Getting a feel for the speed and pattern play is important for amateur players. One of the biggest problems I see with amateurs is that they don�t practice their speed control often enough and constantly end up on the wrong side of the ball. This drill forces you to move the cue ball around the table, play shape, get on the right side of the ball and get a feel for the speed of the table. You have to stay focused. So, before you start playing the ghost, try this drill. It is easy to set up, not boring and will get you into decent stroke.